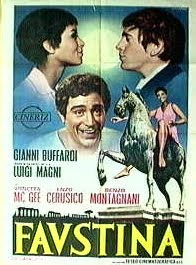 FAUSTINA (1969), Luigi Magni's first film as a director, is to be sure given a modern setting but ancient Rome plays an important part. The main characters, in fact, are "tombaroli", that is those people who steal from Roman and Etruscan tombs, who are specialized in archeological plunder and then sell the precious finds to foreign collectors. The sudden appearance in that milieu of a young dreamer would captivate Faustina, the "tombarolo's" black wife, leading to a series of consequences to be explained mostly by that strange profession and the background of ruins where the characters live. Enzo Cerusico, an Italian better known in America than in Italy as a result of a number of television serials and appearances on Broadway, was the poetic inamorato, Vonetta McGee the young bride, Renzo Montagnani the coarse robber. The satirical force of G.G. Belli's sonnets in Roman dialect seems to inform Magni's next film, NELL' ANNO DEL SIGNORE (IN THE YEAR OF OUR LORD...: 1969), it too appearing in the wake of RUGANTINO. The period and place are the same: Rome around 1825, identical the actor set against that historical background, Nino Manfredi, who is Cornacchia, a cobbler who pretends to be illiterate but is actually Pasquino, known all over Rome for his anti-papal invectives. The imaginary events are interwoven with a true historical episode, the execution of the conspirators of the Carboneria (a secret society from the time of the Risorgimento), Montanari and Targhini, which took place, as a plaque indicates even today, in Piazza del Popolo. Also appearing in the film were Ugo Tognazzi, in the role of the treacherous and shifty Cardinal Rivarola, and Alberto Sordi in that of a fanatical monk. In 1970, Magni wrote and directed, less successfully but always on a high level of entertainment, SCIPIONE DETTO ANCHE L'AFRICANO (SCIPIO KNOWN ALSO AS THE AFRICAN), where the action was carried back to Imperial Rome in order to satirize the political intrigues of power at the time the Roman General was preparing to defeat Carthage. Along with Marcello Mastroianni in the title role, Magni used his brother, Ruggero Mastroianni, a well-known Italian film editor, Vittorio Gassman, Turi Ferro and Silvana Mangano.